Combine butter, sugar, water and corn syrup in a large, heavy saucepan over medium heat; stir constantly to dissolve the sugar and melt the butter. Bring the mixture to a boil, occasionally brushing down the sides with a wet pastry brush to prevent crystallization. Cook, stirring frequently, until mixture registers 300°F. on a candy thermometer. (Check frequently as temperature approaches 300°F, since it cooks quickly and can scorch.) Remove from heat, stir in extract. Add 1 cup nuts and stir to mix well. Pour onto an oiled or non-stick sprayed 18x12-inch baking sheet. Use a spatula or spoon to spread the mixture to an even thickness. Cool for about 5 minutes and score into 1-inch squares using a large knife. Sprinkle chocolate chips over top of squares; as the chips begin to melt, spread evenly with knife or metal spatula over top of candy. Sprinkle with remaining chopped nuts. 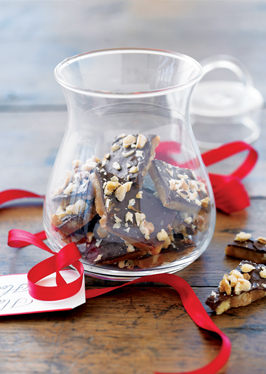 Allow the toffee to cool completely. Break or cut where scored into 1-inch squares.